The Brussels Post. May ,7 1924. Page 5. 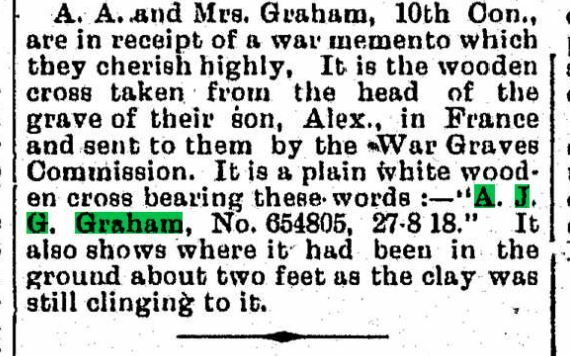 A.A. and Mrs. Graham, 10th Con.m are in receipt of a war memento which they cherish highly. It is the wood cross taken from the head of the grave of their son, Alex, in France and sent to them by the War Graves Commission. It is a plain white wooden cross bearing these words:- “A.J.G. Graham, No. 654805, 27-8-18.” It also shows where it had been in the ground about two feet as the clay was still clinging to it. 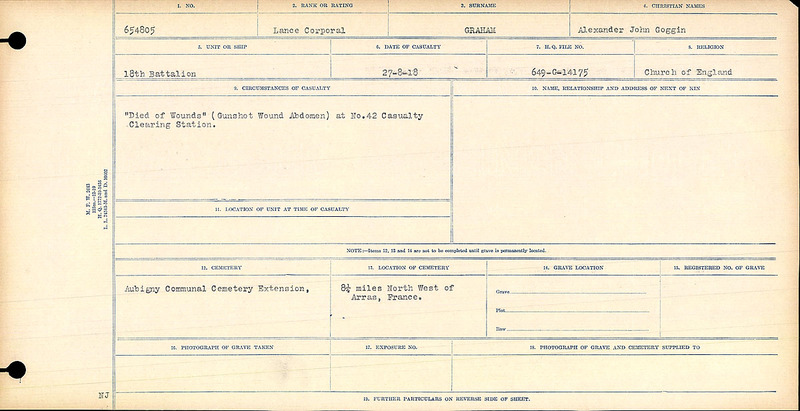 “Died of Wounds” (Gunshot Wounds Abdomen) at No. 42 Casualty Clearing Station. Grave Marker – Grave Marker in Aubigny Communal Cemetery Extension, France Photo courtesy of J. Elliott/J. Rutledge, The Men of Huron WW1 Project. Via CVWM.